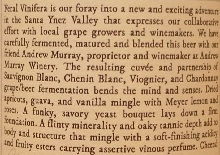 Brewer Description: (from bottle) Our region is blessed with an abundance and variety of fresh fruit. South of Barrelworks in the hills surrounding the hamlet of Ojai, there are groves of citrus-oranges, lemons, grapefruit and tangerines. We’ve been lucky to work with the Ojai native Friend’s Ranches who specialize in tangerines. Friend’s offered the W. Murcott tangerine which we zested for aroma, juiced for flavor, and then fermented with our base beer of Bretta Weisse to create a metamorphosis. Brought to life was Bretta Tangerine! 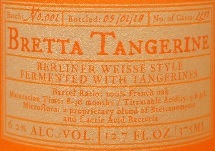 A bountiful bouquet of citrus mingles with pronounced herbal notes, leading to funky, yeasty, citrus flavors. Soft cereal and oak aromas are enveloped by a firm acidity and tartness and punctuated by zesty tangerine. The finish is dry and crisp; a thoroughly enjoyable beverage. Santé! Intro: A 375ml corked and caged bottle. Batch No. 001, bottled on 1st May 2018. Poured into a 3 Fonteinen stemmed glass. Appearance: A lightly hazy golden orange colour with a one finger white head that dissipated fairly quickly to a thin replenishing layer, while leaving only sparse to no lacing. 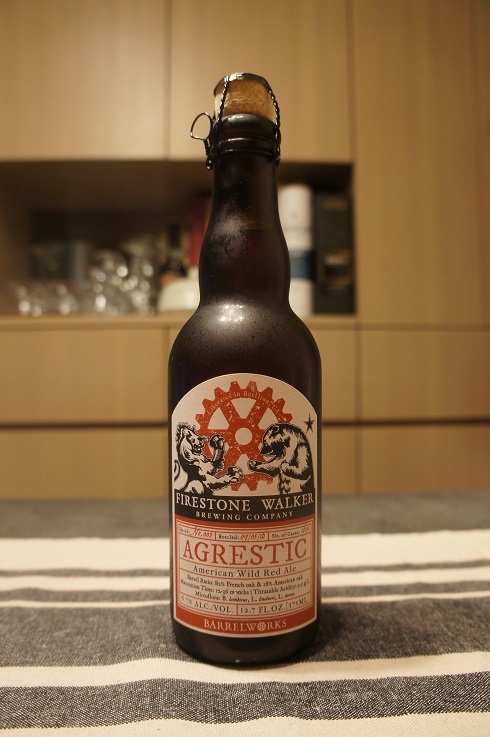 Aroma: Funky, orange juice, mandarin, unripe mango, unripe apricot, and a touch of oak. 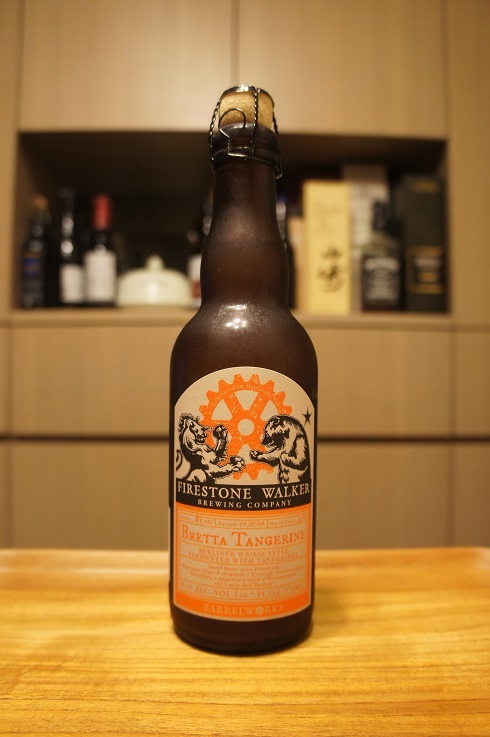 Taste: Light sourness, tangerine, mandarin, orange candy, oak, with a light funkiness. Mouthfeel: Light bodied with moderate to soft carbonation. Overall: Not up to the standard of Bretta Rose, but still nice and easy drinking with good citrus, funk and barrel notes. Carbonation could be higher for a Berliner Weisse, but the lack of, doesn’t take too much away from it. 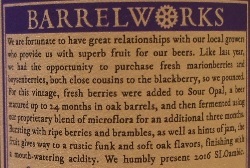 Brewer Description: (from bottle) We are fortunate to have great relationships with our local growers who provide us with superb fruit for our beers. Like last year, we had the opportunity to purchase fresh marionberries and boysenberries, both close cousins to the blackberry, so we pounced. For this vintage, fresh berries were added to Sour Opal, a beer matured up to 24 months in oak barrels, and then fermented using our proprietary blend of microflora for an additional three months. Bursting with ripe berries and brambles, as well as hints of jam, the fruit gives way to a rustic funk and soft oak flavours, finishing with a mouth-watering acidity. 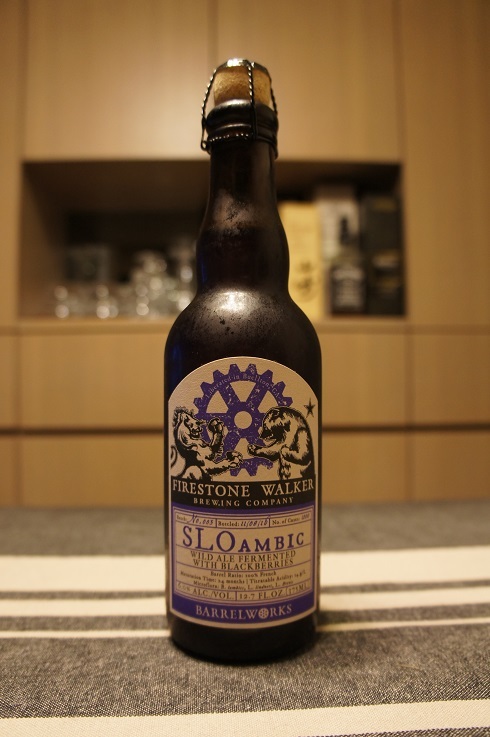 We humbly present 2016 SLOambic. Intro: A 375ml corked and caged bottle. Batch No. 003, bottled on 8th November 2016. Poured into a 3 Fonteinen stemmed glass. Appearance: A clear ruby purple colour with a big two finger pinkish head that dissipated quickly while leaving only sparse to no lacing. Aroma: Tart, blackberry, mixed berries, lightly jammy. 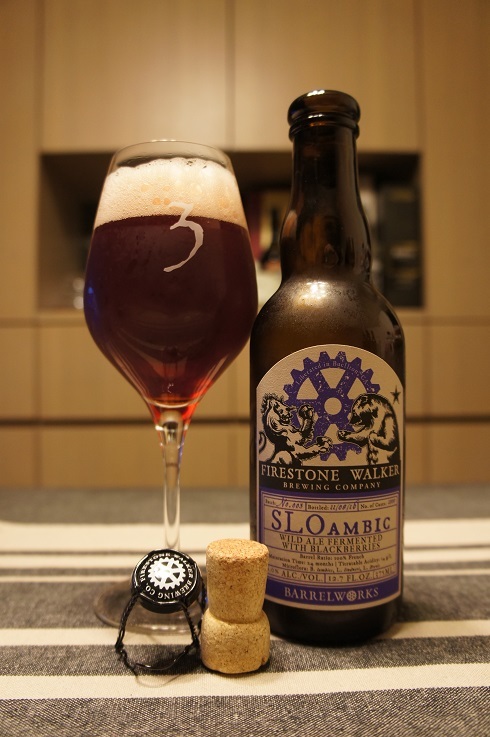 Taste: Sour, tart, blackberry, mixed berries, with a touch of oak and funk. Overall: Very nice blackberry aroma and flavours. Enjoyable and easy to drink. Brewer Description: (from bottle) What began as a birthday gift took on a life of its own. 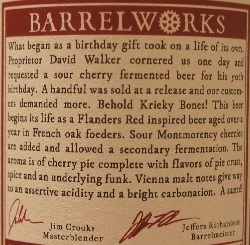 Proprietor David Walker cornered us one day and requested a sour cherry fermented beer for his 50th birthday. 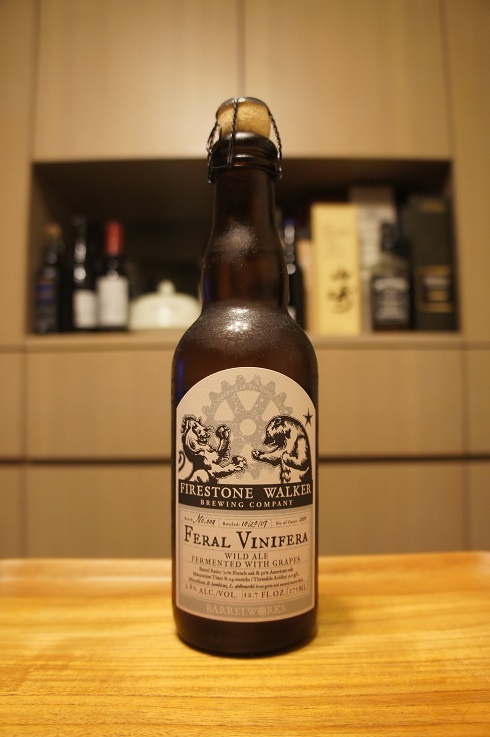 A handful was sold at a release and our customers demanded more. Behold Krieky Bones! This beer begins its life as a Flanders Red inspired beer aged over a year in French oak foeders. Sour Montmorency cherries are added and allowed a secondary fermentation. 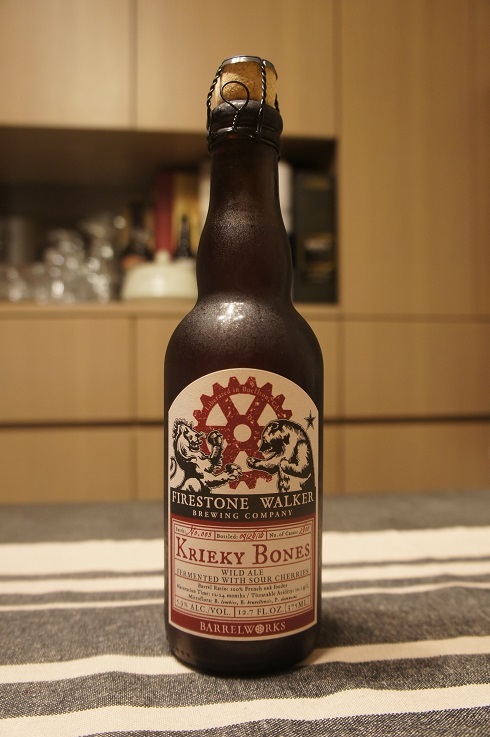 The aroma is of cherry pie complete with flavours of pie crust, spice and an underlying funk. Vienna malt notes give way to an assertive acidity and a bright carbonation. A sante! Intro: A 375ml corked and caged bottle. Batch No. 003, bottled on 26th September 2016. Poured into a Lost Abbey teku glass. Appearance: A clear reddish dark copper colour with a big two finger white head that had great retention while leaving some nice lacing. Aroma: Tart, sweet and sour, cherry with only hints of funk and vinegar. Taste: Tart, lightly sour, cherry, oak and vanilla with hints of almond. Mouthfeel: Light to medium bodied with nice high carbonation. Overall: Very nice and easy to drink with good cherry flavours. 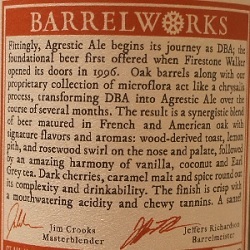 Brewer Description: (from bottle) Fittingly, Agrestic Ale begins its journey as DBA; the foundational beer first offered when Firestone Walker opened its doors in 1996. Oak barrels along with our proprietary collection of microflora act like a chrysalis process, transforming DBA into Agrestic Ale over the course of several months. 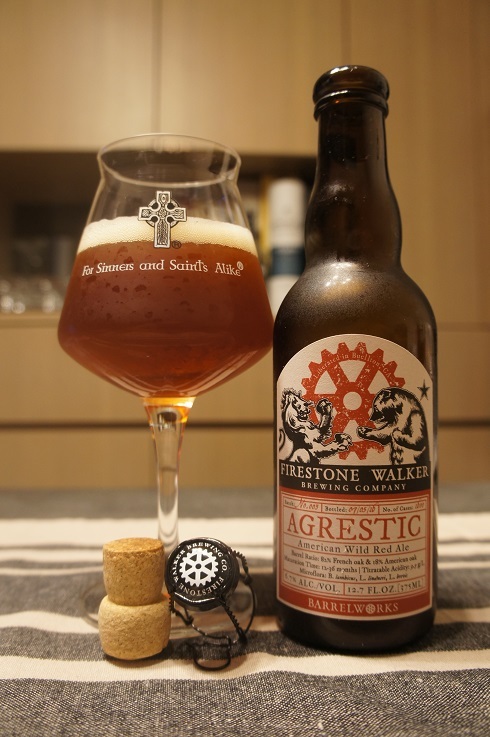 The result is a synergistic blend of beer matured in French and American oak with signature flavors and aromas: wood-derived toast, lemon pith, and rosewood swirl on the nose and palate, followed by an amazing harmony of vanilla, coconut and Earl Grey tea. Dark cherries, caramel malt and spice round out its complexity and drinkability. The finish is crisp with a mouthwatering acidity and chewy tannins. A sante! Intro: A 375ml corked and caged bottle. Batch No. 003, bottled on 5th July 2016. Poured into a Lost Abbey teku glass. Appearance: A clear amber copper colour with a one finger tanned head that dissipated slowly while leaving some nice lacing. Aroma: Tart, cherry, lemon, oak, vanilla and coconut. Taste: Tart, lightly sour, lemon, cherry, oak and vanilla. Mouthfeel: Crisp, light to medium bodied with high carbonation. Overall: Nice, enjoyable and great to drink.